Opening the 2016-season Röda Sten Konsthall presents a large-scale solo exhibition with the Finnish artist-duo IC-98. Opening the exhibition season of 2016, Röda Sten Konsthall is delighted to present Tides of Time by the Finnish artist group IC-98 consisting of Visa Suonpää and Patrik Söderlund. Tides of Time represents IC-98’s largest exhibition in Sweden to date and comprises of video installations, original drawings and publications. Their collective works witness and record the complex and multi-layered relationships between humans, history, myths and nature, ultimately questioning humanity’s understanding of the passage of time and their place and existence in the history of geological evolution. Combining elaborately detailed pencil drawings with greyscaled digital animation, IC-98 have for more than a decade built up an expansive and rich visual universe depicting the world after the era of humankind. Characterized by strange and dark hybrids of abandoned landscapes, their intensely abstracted imagery weaves myriad bridges between the material and mythical, the individual and the collective, nature and culture. Shaped by these interlaced forces and realms, their works stand out as equally meditative, mesmerizing and haunting. IC-98’s work is strongly rooted in humanity’s presence on Earth, investigating body politic, social formations, architectural constructions and changing ecologies. Nevertheless humans never seem to appear in their works. Only remnants of human actions occasionally surface, like the decay of a previous inhabited building, or a floating raft suggesting human life was once here. In using symbolic rather than descriptive narratives, IC-98 unfolds an open dialogue between human and geological existence, while balancing emotional states of awe and fear, dystopia and melancholia. For Tides of Time, the galleries of Röda Sten Konsthall have been transformed into an animated world of large-scale and slow-moving installations featuring a selection of IC-98’s most celebrated animation works accompanied by a selection of original drawings and the artists’ self-published books. Abendland (Hours, Years, Aeons) depicts an old, towering tree creaking ominously in the dark forest – a work which IC-98 represented Finland with at the 56th Venice Biennial in 2015. Arkhipelagos (Navigating the Tides of Time) - from which the exhibition also takes its title – displays a 9 meters wide horizontal view that depicts a group of free-floating rafts struggling amidst all-encompassing waves. The more urbanely illustrated A View from the Other Side time-loops a 19th century portico in Turku as the seasons and centuries change around it. On display for the first time is IC-98’s newly produced piece Nekropolis, developed in collaboration with animator Markus Lepistö and Juan Duarte Regino with music composed by the Finnish drone band SINK. In Nekopolis, a giant moving cloud lingers over a rustic mountain landscape, in anticipating suspense. Something is about to happen – or maybe it already did? All works in the exhibition are either accompanied by a deep-bass, dramatic sound score or utter silence. 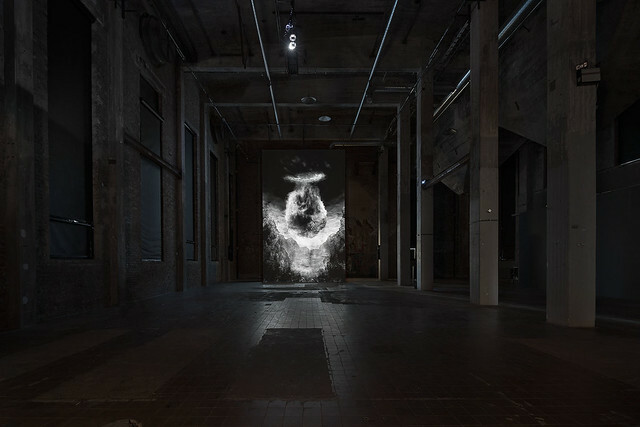 As the title Tides of Time suggests, an overlying theme in the exhibition is the overarching phenomenon of the passing of time. In IC-98’s realm, the sense of time is stretched, combined and elongated, transcending our normal understanding and experience of time, becoming a part of a larger geological story – also known as “deep time”. Rather than an ever linear series of events, time becomes a looping sequence of places that repeat themselves into infinity. Despite the complexity involved in the technical production, the works stand out as slow, elegant and unaggressive in their sheer simplicity. Through these images IC-98 succeeds in addressing the disturbing reality of the Anthropocene, while leaving out any moralizing overtones. Instead they offer the viewer a space for profound reflection. IC-98 (originally Iconoclast, founded in 1998) is an artist duo comprising Visa Suonpää (b. 1968) and Patrik Söderlund (b. 1974). IC-98 projects combine research, text, installation, drawing and animation, rooting their investigations into issues of body politic, social formations, architectural constructions, disappearing ecologies and the presence of human and natural history in everyday life. IC-98 has exhibited extensively internationally. They represented Finland at the Venice Art Biennale 2015 and in January 2016 they showed their work Abendland (Hours, Years, Aeons) at the Sundance Film Festival in the category New Frontier Short Films. Their recent solo exhibitions include Dundee Contemporary Arts, Scotland (2015), Helsinki Art Museum, Finland (2015), Conde Duque Madrid, Spain (2014), Beaconsfield, London, UK (2014) and Turku Art Museum, Finland (2013). Their works have been presented in numerous group exhibitions, most recently at the Frankfurter Kunstverein, Germany (2014), Laboratorio Arte Alameda, Mexico City (2014), Quartair, Netherlands (2014), Moonshin Museum, South Korea (2014), Kiasma, Helsinki (2014), MAMba, Argentina (2012). IC-98 has also had solo art fair presentations at Moving the Image Art Fair, New York (2015), ARCOmadrid (2014), Volta, New York (2013) and Volta, Basel (2012). Works by IC-98 are found in numerous private and public collections in the Nordic countries. IC-98’s prize-winning self-publishing initiative, Iconoclast Publications, has brought out 16 publications to date.